This unbreakable, watertight, airtight and chemical resistant case is made of ultra-high Impact structural copolymer that makes it extremely strong and durable. It has a 0.25" (6.4 mm) neoprene o-ring, ABS latches that seal perfectly and includes an automatic purge valve for quick equalization after changes in atmospheric pressure. The top handle, oversized side handle, a retractable extension handle and strong polyurethane wheels with stainless steel bearings makes it portable and easy to carry around. The padlock protectors provide added strength and extra security against cutting and theft. As with all Pelican cases, even this version comes with an Automatic Pressure Equalization Valve which releases built up air pressure while keeping water out. 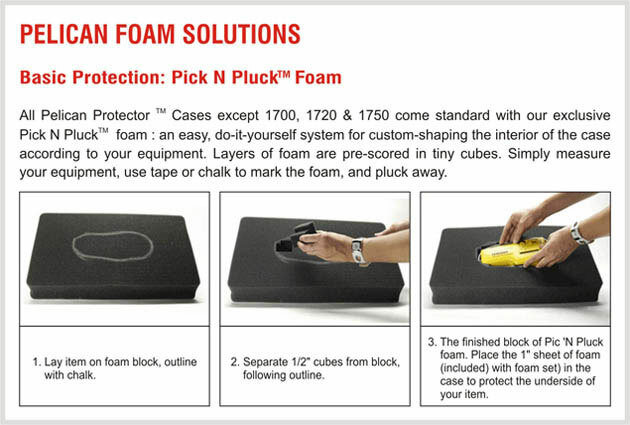 The unique Pelican's Pick N'Pluck foam lets you customize the interior. All Pelican products come with a lifetime guarantee of excellence.